In order to fly an effective aerial campaign, make sure that you have done extensive demographic research into the markets you are planning to fly. Also, make sure that your flight plan is carried out at optimal viewing times. Music Festivals, spring break, NASCAR, beaches, and other areas where people choose to gather outdoors, all offer excellent aerial advertising opportunities. At Van Wagner Aerial Media, we can help you identify which markets and events are perfect for capturing your target audience. As mentioned above, aerial advertising is an ideal choice for raising brand awareness in specific markets. It is also perfect for advertising a new product launch or a recent promotion. Once your banner is produced, the messaging can be changed out to coincide with whatever product or promotion you are currently advertising. 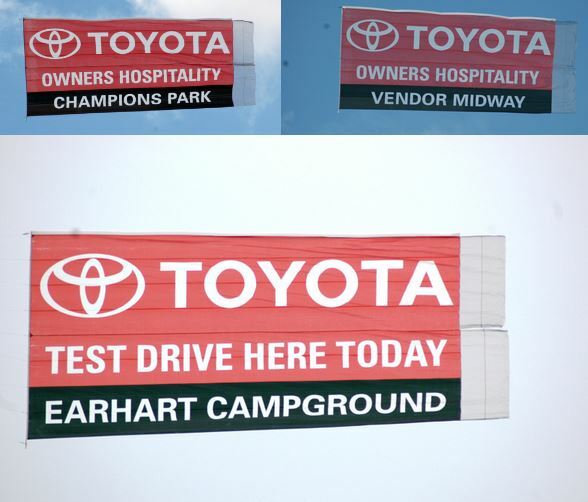 The interchangeable banner material, referred to as a snipe, gives you the versatility to fly your banner in different locales across your region throughout the year(s). You can see in the Toyota aerial advertisement below, the snipe has been changed out in order to keep the messaging tailored. Look at an aerial banner as an investment. It is not a one-off media buy; it is something you can use for years to come to promote your brand. Compare the amount of flights and versatility that a banner offers to other out-of-home media buys. The ROI is far greater than you may have initially thought. Sponsoring a sporting event like NASCAR, MLB, NCAA Football/Basketball, or even a local festival can be extremely costly. Many brands balk at a sponsorship price tag before really even entertaining the idea. But what if you could put your brand front and center at these high-profile events without spending your entire marketing budget? With airplane advertising, sponsorship exposure is completely within reach. As mentioned in the point above, once your banner is produced, you can fly a variety of notable events in your target market. You can even execute multiple flights in markets across the United States. Your sky banner will fly above the stadium, free from the clutter on the ground below. It is human nature to look up when an ad is flying overhead. In fact, over 70% of stadium attendees remember the messaging on an aerial banner. By choosing aerial advertising, you are getting sponsorship bragging rights without the cost. In recent years, advertisers have chosen aerial advertising to do far more than just promote their brand or product. Airplane banners and other forms of aerial advertising, e.g. sky writing, blimps, and hot air balloons, are now being utilized as an eye-catching platform to make a big statement in the sky above. Technology companies like Google and Cisco are utilizing sky writing to capture and hold people’s attention on their sky ads. But it’s not just big brands that are using aerial to get their point across, consumers have turned to airplane advertising to get their voices heard. 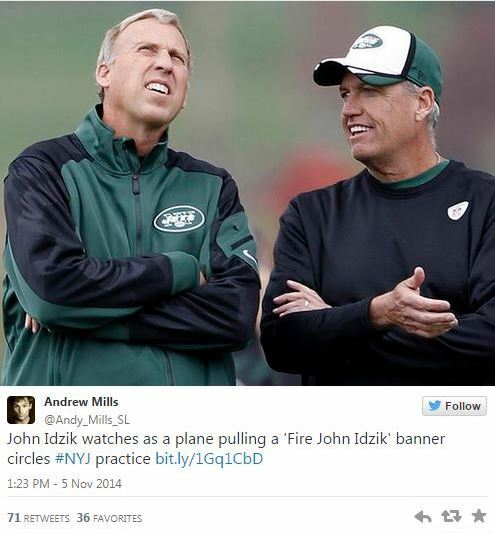 In late 2014, disgruntled Jets’ fans flew an aerial banner over the Jets’ training complex that simply stated, “Fire John Idzik.” The banner flew multiple times over a two month period, and was accompanied by billboard purchases near MetLife stadium. The highly-publicized banner flights trended on Twitter and made national headlines. People are fascinated by anything that flies, and the mystique surrounding aerial advertising makes it a social media magnet. With the right creative, your aerial banner or sky writing message could start a social media wildfire. Savvy aerial advertisers are turning to the sky to promote branded hashtags that really get people Tweeting, Instagraming, and sharing on platforms like Facebook. 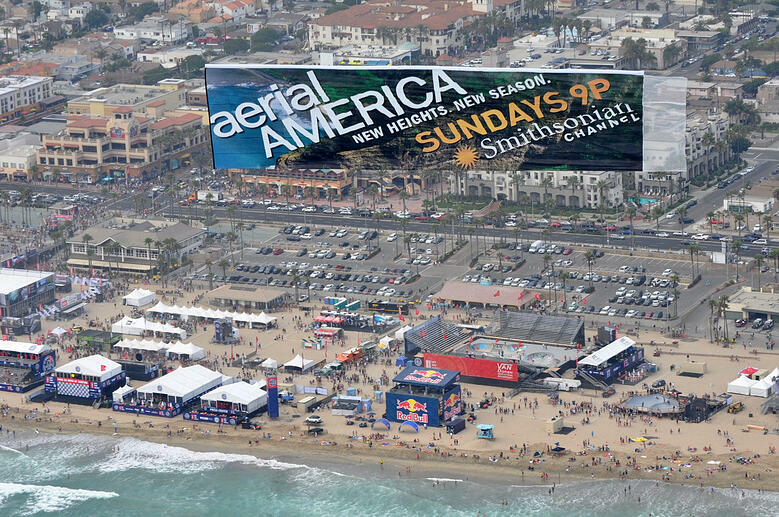 In 2014, ABC flew an aerial banner to tease the upcoming season premiere of the hit TV show Scandal over California and New England beaches. The flight ignited a Twitter frenzy. Thousands of Twitter and Instagram users tweeted, re-tweeted, and Instagrammed photos of the banner’s flight. 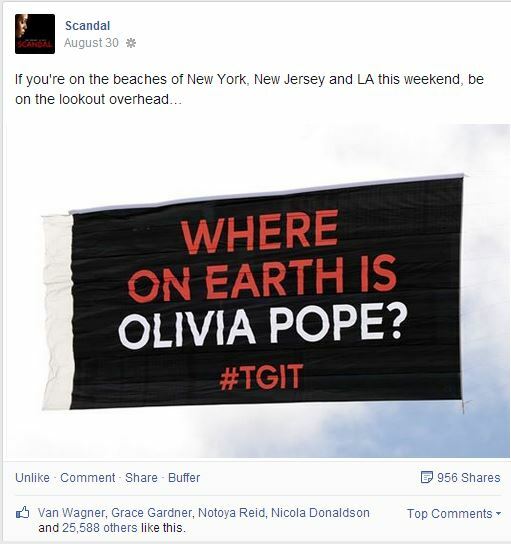 The Scandal Facebook page posted a picture of the banner that garnered almost 1,000 shares, 25,733 likes, and over 300 comments. Van Wagner Aerial Media can help you put together a campaign that will get you the impressions you are looking for. Not sure which markets or events to fly? We can help with that too. Getting started is simple, click the button below for a free quote and we will give you a complimentary assessment at your convenience. Want more information about aerial advertising? Download our free guide!